While the rest of New Zealand languished in its first rain for a number of weeks, the Wairarapa district sweltered in scorching temperatures which exceeded 35 degrees over Waitangi weekend. 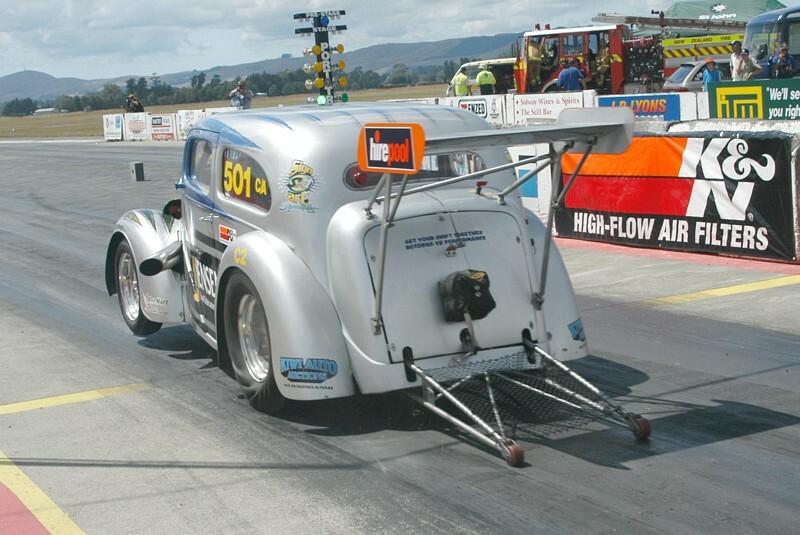 Conditions weren't exactly ideal to lure large numbers out of Wellington, yet an estimated 5000 spectators braved the sweltering conditions to witness the best racing this season at Masterton Motorplex. With backing from K&N Performance Filters, the third round of New Zealand's drag racing National Championships was well attended with 135 entries chasing points and prize-money. A brand new Port-a-tree timing system breathed new life into Masterton's organisation and allowed National records to be claimed in the southern North Island for the first time ever. 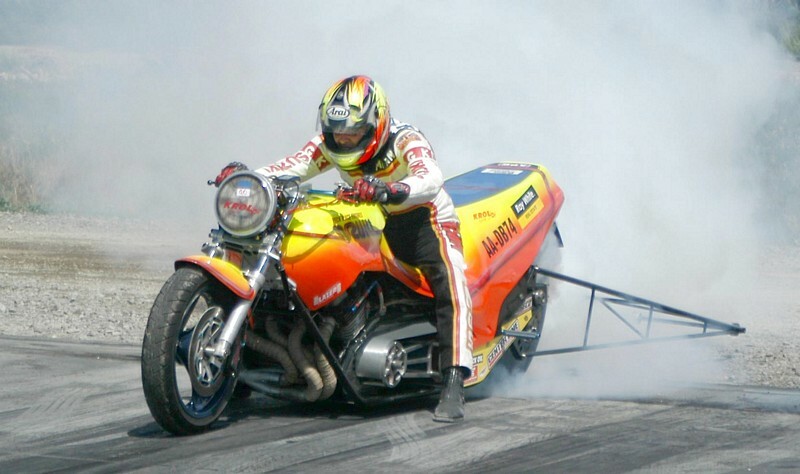 Martin Peck on his nitrous assisted dragbike picked up the track's first National record with an 8.049/163.04 backed up by a 7.95/163.04 in AA/DB class. Peck's 7.95 was the first time a Japanese hybrid had dipped into the sevens in New Zealand history which bodes well for the future of the class. Top Alcohol was low in numbers due to recent breakages at the ACDelco Northern Nats. The final pitted Graeme Blummont in his lightly dosed nitro fuelled T/AD against the Altered of Dave Drew. It was the Drew car which drove away with the win, an off-pace 8.74/265kph won it over Blummont's trailing 8.08/265kph. Top Doorslammer once again proved a valuable entertainment package for the eager lower North Island fans. Six entries, all very close in the National series pointscore, went out in the first round of qualifying in an effort to chase the additional Top Qualifier's points. By the end of the first session, Chris Tynan had lost his bottom blower pulley which upon inspection, then escalated into further block damage. Mark Holland was next to drop out after he smashed holes in both sides of his Chrysler's brand new block. The resulting souvenir debris-collection was enough to hand a piece to almost every spectator at the facility. The field, depleted to four runners, still put on a show fans had paid to see at the K&N backed event. Mark Thomas and David Green were just points apart in the series so it was imperative they both made a good showing to stay in the chase with just one meeting left. It was Thomas in his repaired PPG/Redline Holden who came out on top with a peddled 7.57 in the final. Green in his Radio Hauraki Corvette left the line hard but moved out of the groove and got off the throttle to trail through the traps, well off the mid 7-second pace he had shown earlier in the day. The other two contenders certainly put on a spectacle for the crowd. 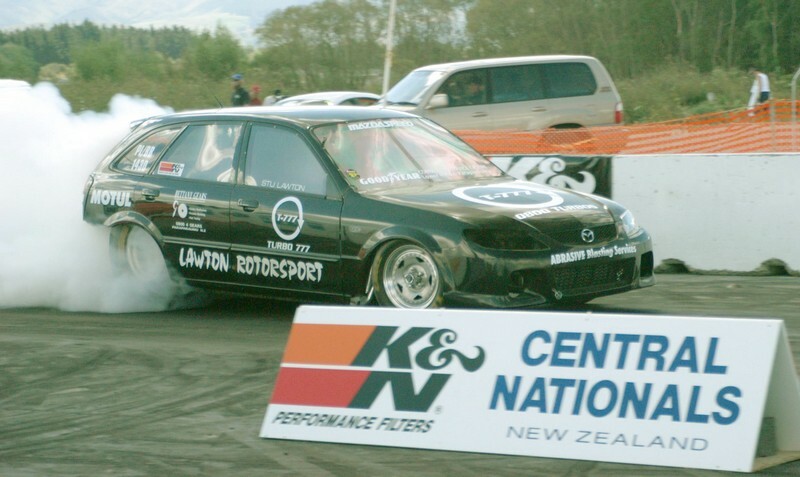 Whakatane's Tom Richardson once again laid down the biggest smoke screens of this K&N event. His 100-metre burnouts are now the talk of the pits and the times are also beginning to drop from his un-sponsored '57 Chevy. Richardson's foe was the outrageous Chev Beretta of Graeme Alexander. The epitome of evil, this car has huge amounts of horsepower in an extremely short wheelbase. No matter what happens when Alexander comes to the line, it is always spectacular. Their pairing ended with a win to Richardson with an 8.50 beating the Beretta's quicker 8.12. 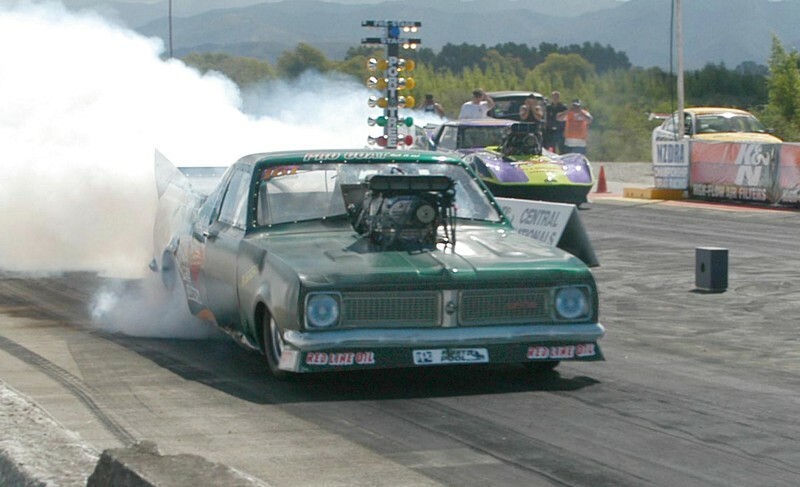 Next, and final round of this year's NZDRA National Drag Racing Championships is the Century Batteries NZ Nationals at Champion Dragway near Auckland on March 5 and 6. Kevin Foothead was off his usual pace and had to be content with a runner-up position in the 9.90 Super Gas division. 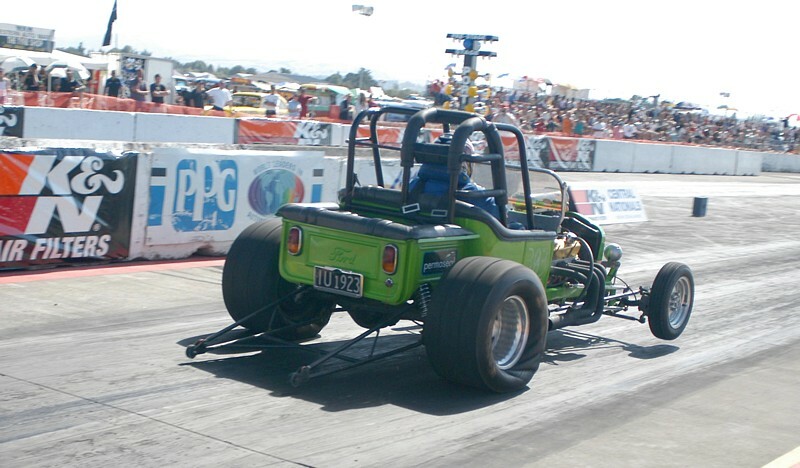 Consistent 10.20s were order of the day from his T-bucket. 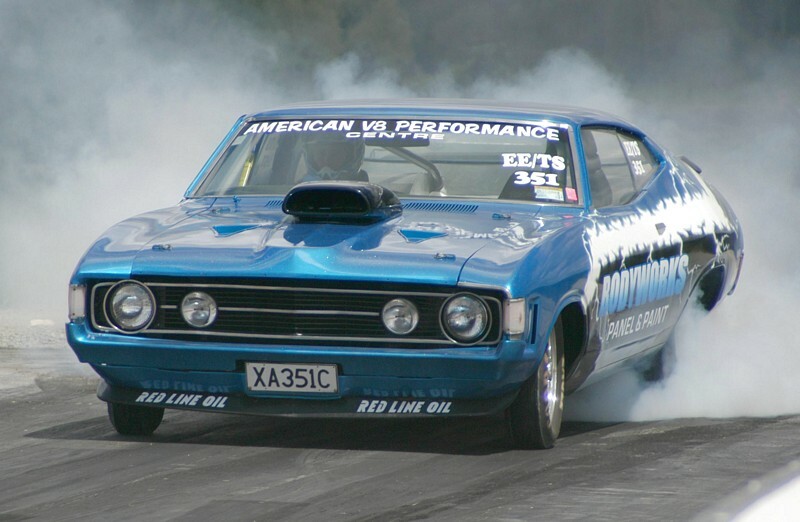 Wellington's Gary Cawthra proudly flew the Ford badge with his record holding Falcon. He ran a best of 9.70/235.89 in Top Street Eliminator. Kelly Rennie didn't have the best of days in his awesome Jag. Every pass he overpowered the track surface and looked more like he was chasing a speedway title than going in in a straight line. His best from the Online Roadmarkers car was 9.11/255.90kph. 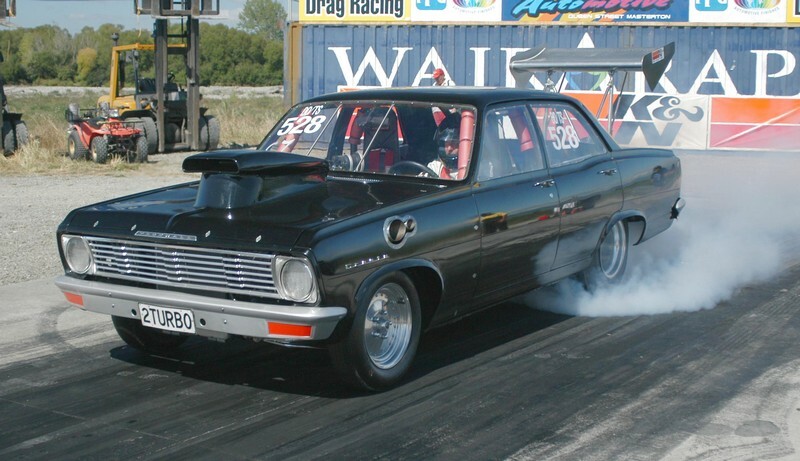 Lower Hutt's Graeme Bates runs a twin turbocharged Donovan small block Chev in his Vauxhall and regularly gives the Top Street division a fright. His 9.32/239.80kph times at the K&N Filters Central Nationals gave English heritage fans something to cheer about. New Zealand's quickest street car is owned by John Hickman of New Plymouth. 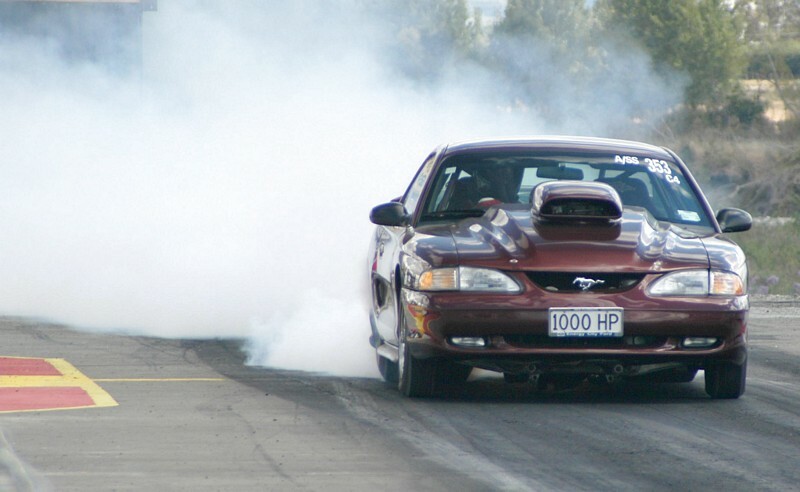 The 1000-horsepower registration plates give the game away when you meet Hickman's Ford Mustang at the lights. A best of 9.49/235.80kph gave him a third place in the high stepping Super Stock division. Tauranga's Ash Beck is destined for to take the New Zealand title in Competition Eliminator. His Chev powered Ford Popular ran as quick as 8.98/238kph on its way to the K&N Filters Central Nationals win. Martin Peck made history at the K&N Filters Central Nationals with New Zealand's first 7-second time from a AA classified dragbike. A 7.95 at 262kph was his best for the weekend. Pro Import winner was Stuart Lawton with a best of 9.86/218kph on his way to claiming the K&N Central Nats title. Heavy hitter in the National series is Gary Bogart in his Ford Falcon (near lane), however he couldn't hold off a late charge from local racer Scott Millar's Mustang when he drove around the startline handicap with a 9.21/239 over Bogart's 10.14. Top Alcohol was the domain of Wellington's Dave Drew (far lane) who ran as quick as 8.10/269kph on his way to the K&N title. His opponent was the nitro injected rail of Palmerston's Graeme Blummont who was way off his usual pace with an 8.08 pass in the final. Mark Thomas (near lane) in his Top Doorslammer PPG/Redline Holden ute outpaced the Radio Hauraki Chev Corvette of David Green to put him in the National Series points lead going into the final round. Both cars ran 7.5 second passes at over 300kph at the K&N Performance Filters event.